They're saying around 25,000 turned out in downtown Raleigh to protest the direction of North Carolina under the Republican regime. 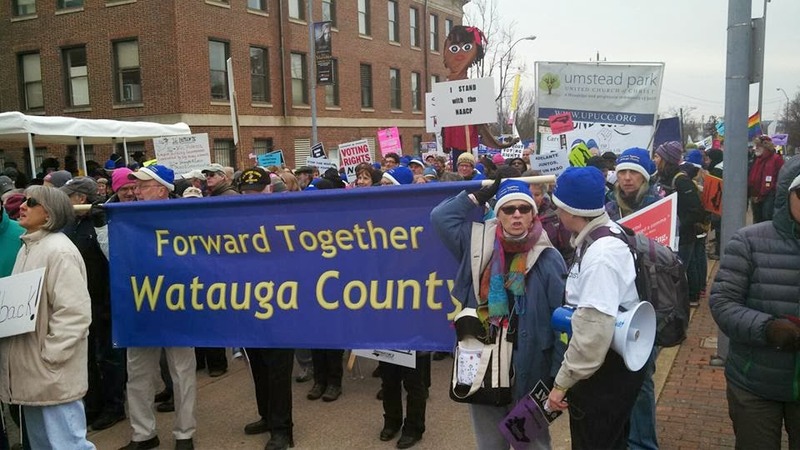 Almost 200 from Watauga County were in the "mammoth" crowd. It looked like a lot more than 25,000 to me. My daughter and I parked in the deck that was half a block from the stage where Rev. Barber and the other spoke. We walked down to Shaw and then marched back. We decide to go up in the deck to view the speeches on the big screen, and so we could get a good look at the crowd. There was a solid mass of people for at least five blocks. It was an amazing and inspirational day. BS! Me and my superior team from the Data NSA Base located in Utah at our Secret Bunker on Hillsbough Street using Computer enhanced New Age math show 3972 Humans and 27 Black Crows plus 14 ChickenHawks from undercover Republicans and 67 Homeless persons who were begging for handouts along with a Group of HO's from the on-line DC Services of Washington North Carolina.